To pump water to the plants I have a 12V pump. 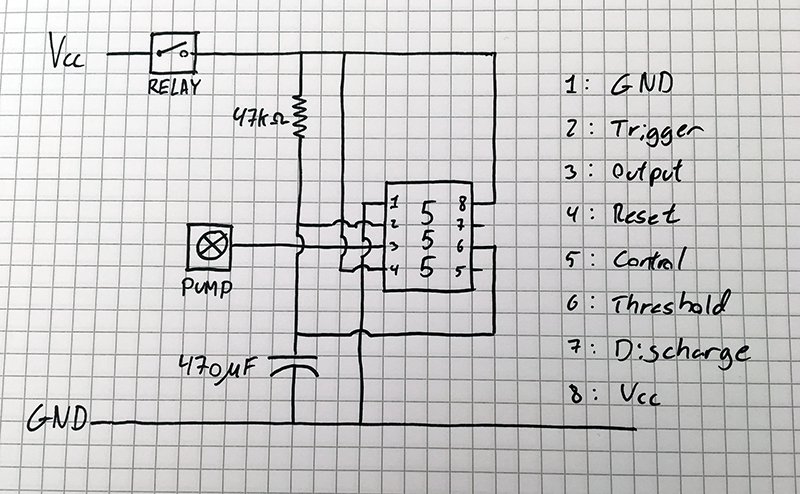 This is going to be controlled by a relay connected to a GPIO on the Raspberry Pi – pretty straight forward. I am a firm believer in Murphy’s Law. Therefore, I am convinced that the computer will crash when the pump is running resulting in a flood. Thus, I’ll implement a hardware cutoff/timeout mechanism using a 555 timer chip. The 555 is very versatile. It is configured with resistors and capacitors to achieve different behaviour. This can be an on/off pattern like a blinking LED. Or a delayed on based on an other signal. Or as in my case turning off a signal after a period. Check out 555-timer-circuits.com for more uses of the chip. This is my design to get a cutoff after about 30 seconds. Here is a video of a prototype in action.